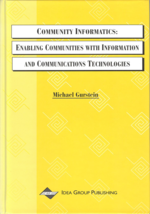 Although many community informatics (CI) efforts to date have been successful (see e.g., Beamish, 1995), few appear to have been part of a strategic response to the “big” problems of the environment and society; typically they address specific needs of particular communities, and have limited influence outside their scope. Nevertheless, they have created a wealth of experience which may be used in new endeavors, since they have exercised numerous technologies and economic models. However, if the concept of “community” is going to play a more important role in establishing sustainable economic, ecological and cultural systems for the future, community informatics will need to develop not just better solutions, but a strategy to support the community ideal. This chapter argues that the object of such a strategy should be a regional information infrastructure (RII), whose purpose is to provide a knowledge-processing context for physical communities. The definition of requirements for an RII is effectively an expression of a community ideal, or vision, in terms of a technological strategy. Technical architectures stemming from the requirements represent a repository of solution patterns which can be reused and evolved. Of course, any such strategy is predicated not only on a certain kind of community vision, but the idea that “community” is indeed an effective response to global and local problems; thus the themes of community and knowledge are firstly explored as a background to the discussion of the RII.